For more than a thousand years, Balinese worshipers have been drawn to Pura Tirta Empul, whose sacred spring is said to have been created by Indra and to have curative properties. The tradition continues almost unchanged at the temple today. Legend has it that the sacred spring was created by the god Indra. His forces had been poisoned by Mayadanawa, so he pierced the earth to create a fountain of immortality to revive them. An inscription dates the founding of a temple at the site to 926 AD. Ever since – for more than a thousand years – the Balinese have come to bathe in the sacred waters for healing and spiritual merit. The Tirta Empul Temple includes the traditional Balinese split gate along with shrines to Shiva, Vishnu, Braham, Mt. Batur, and Indra. There is also a large open pavilion in the main courtyard, useful for relaxing in the shade. But the main attraction here is a long rectangular pool carved of stone, filled with koi and fed by the sacred spring via 12 fountains. Worshippers first make an offering at the temple, then climb into the main pool to bathe and pray. Many collect the holy water in bottles to take home. Nearby there are two smaller pools fed by the spring. Overlooking the temple on a hill above is a suprisingly modern building: the Government Palace, built in 1954. 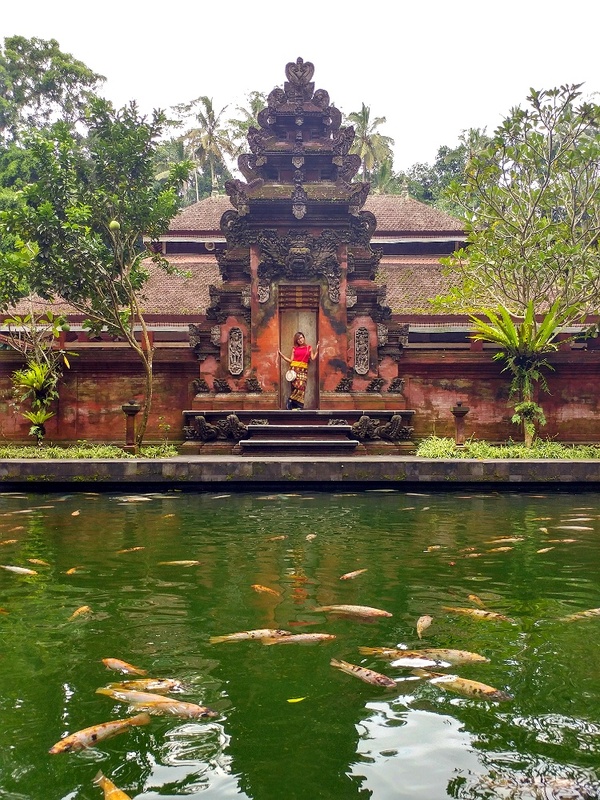 Originally a residence for Dutch officials, it was later used by former President Soekarno during his frequent trips to Bali.Pura Tirta Empul is located in the village of Tampak Siring, accessible by public transportation from Ubud. The souvenir stands outside the temple specialize in the local craft, carved bone jewelry.